Though blind, Sun Toucher is wise in matters of perception. His eyesight was lost by his staring at the Daystar for too many years, but outer sight appears to have been exchanged for the inner kind. 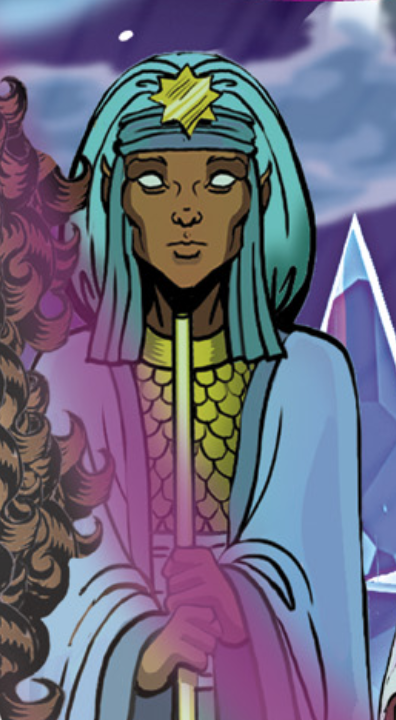 He is one of the oldest members of the Sun Folk, and wields a subtle magic that allows him to telepathically “see” into the hearts and minds of others as well as to interpret patterns of the climate, weather and impacts of the celestial bodies surrounding the World of Two Moons. While Savah is undoubtedly the authority that the Sun Folk look to for matters of leadership, they go to Sun-Toucher for day-to-day guidance. He is fair, judicious and an important source of advice for his people. Sun Toucher was the first to accept the Wolfriders into the Sun Village even after the wild woodland elves attacked. He became a mentor of sorts to Skywise, based on their mutual curiosity regarding the workings of the heavens. “Sun Toucher” is actually just a title; his actual name is Anatim, but few other than his lifemate Toorah call him by it. He now resides in the Palace of the High Ones, helping the other residents to learn the ways of the Firstcomers.